One officer was a lifesaver at the polls. A Michigan State trooper is being hailed a hero for what he did on Election Day. 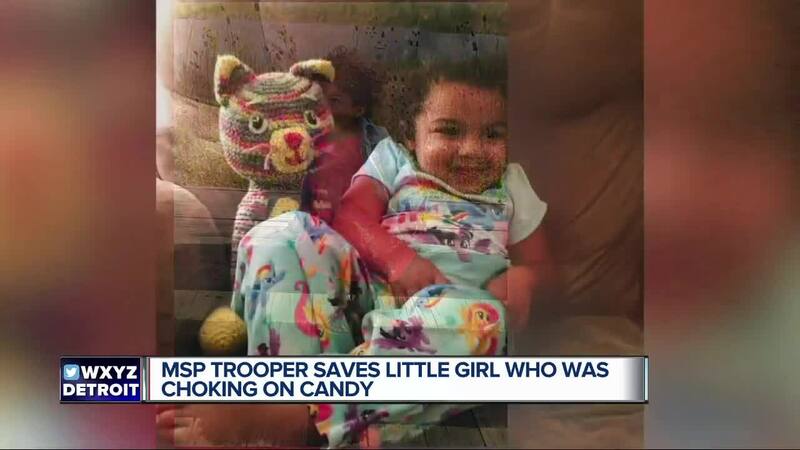 A 1-year-old girl was choking on candy while her parents were casting their ballots. The trooper, who was nearby, quickly rushed into action. One officer was a lifesaver at the polls. A Michigan State trooper is being hailed a hero for what he did on Election Day. A 1-year-old girl was choking on candy while her parents were casting their ballots. The trooper, who was nearby, quickly rushed into action. Michigan State Police Trooper Jesse Graffagnino just got inside the polling location at Forest Elementary in Riverview to vote when he heard a woman’s screams for help. "I was determined," Graffagnino said. "I knew that until EMS got there she was in my hands." Nov. 6, Election Day, polling locations were packed with voters casting their ballots, including Graffagnino who was voting at Forest Elementary in Riverview. "Just before I started voting, I heard a commotion coming from the line where everyone was waiting to cast their ballots," Graffagnino said. He took one look back and his training quickly kicked in. "I immediately decided to jump up (and) take action," he said. Little Ella Mae Kate was with her parents, Angel and Jameson, when she suddenly started choking on a candy. When every second counts, Graffagnino knew he couldn’t waste any time and started doing CPR. "I administered five more back blows, about three or four blows into the second set of back blows I noticed a distinct object come out of her mouth and hit the gym floor," Graffagnino said. "She then proceeded to vomit in my hand." He added that he noticed a deep gasp for air, then the child took a big breath. Ella turns 2 next month. Graffagnino would like to be at her birthday party and have a bond with the little girl and her family for years to come. "I’m going to stop by, I plan on it," he said. "Very respectful family. Ella’s a bright girl, very special and hopefully, I can be a part of that." Graffagnino has been with MSP for just under three years. He’s encouraging everyone to get CPR trained. As for this incident, he’s just thankful he was in the right place at the right time.